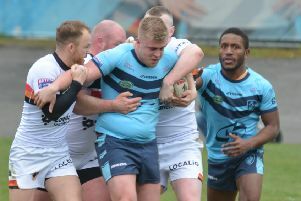 Featherstone Rovers came out on top 38-28 in Friday night’s Kingstone Press Championship game at Dewsbury Rams after the teams were locked at 20-20 at half-time. French international half-back Remy Marginet scored a hat-trick of tries in a win that lifted Rovers to fourth spot in the table, two points clear of the Rams, who have slipped to sixth place. Dewsbury's Shane Grady challenges Featherstone's Paul Sykes as the Rovers player is about to put in a grubber kick. Picture: Bob Nunn. Photographer Bob Nunn was at Tetley’s Stadium to capture the action.